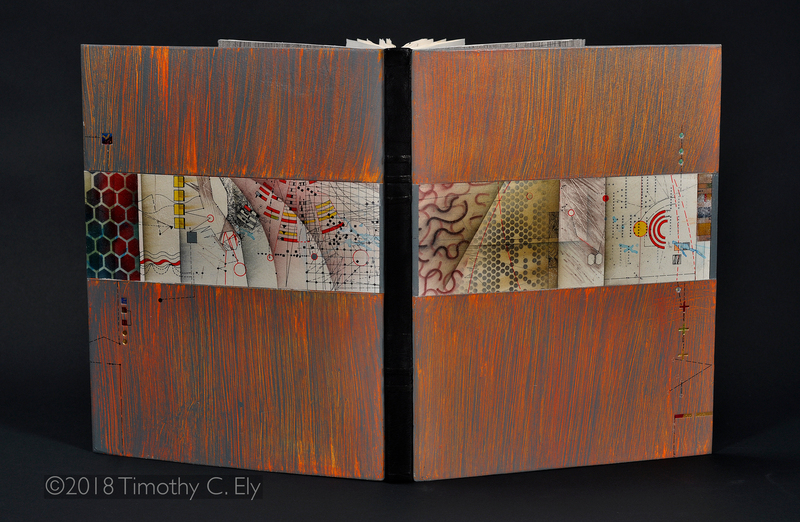 Last week I posted about my new work, SCORE, delivered to the Lilly Library at Indiana University. 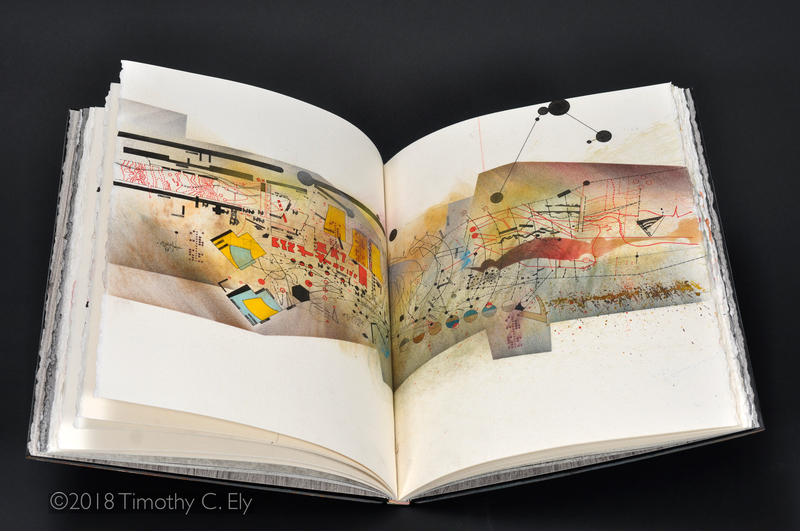 Today I wanted to share more images from the book in a bit of a guided tour. At the same time the following descriptions offer insight into the music which accompanies SCORE. 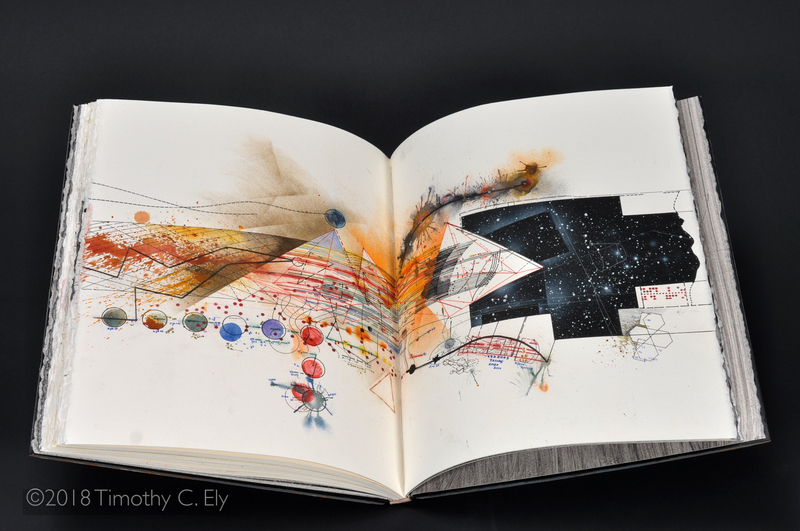 My primary works, like SCORE, start with a set of unique, one-of-a-kind spreads — in the future I’ll visit the process of creating the folios in more depth. 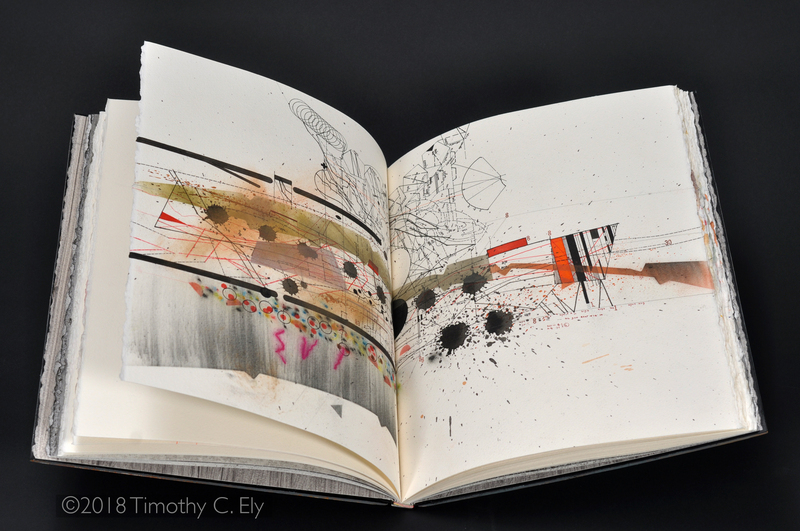 But each one is a unique image resulting from drawing, painting, printmaking, and a range of other methods of creation. When the folios are finished, I use traditional bookbinding methods (as well as some I’ve invented) to bind the pages. An expressionist cover is added to the book and a unique box is made which contains the work. In the case of SCORE, the box also included a CD of music. 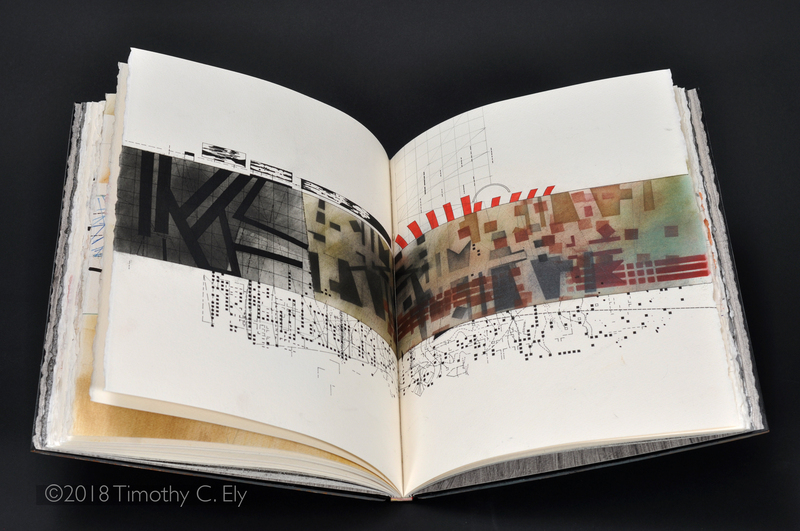 SCORE includes 8 folios — a title page, a table of contents, and six titled folios. You can walk through the 6 primary folios below. Short “splats” were electronically stretched to create long wet whooshes. Soft colored circles and the upper dashed line direct the frantic bass pattern in the first half. At the break in the middle, the upper structure of black lines is sonically explored. Then it’s back to the “heart,” past a cluster of vertical lines (insistent piano) and on to the ending. Both the opening black bars and the later thin black lines are sounded by an iPad version of a Russian graphic synthesizer. Red polygons are heard as granularly julienned guitar playing by Timothy Ely. In the final section, multiple, downward-angled red lines (six descending woodwind voices) drift toward the puttering ending. Rising and falling blue lines (pitches) give way to colored panes (electric guitar) through a changing backdrop. 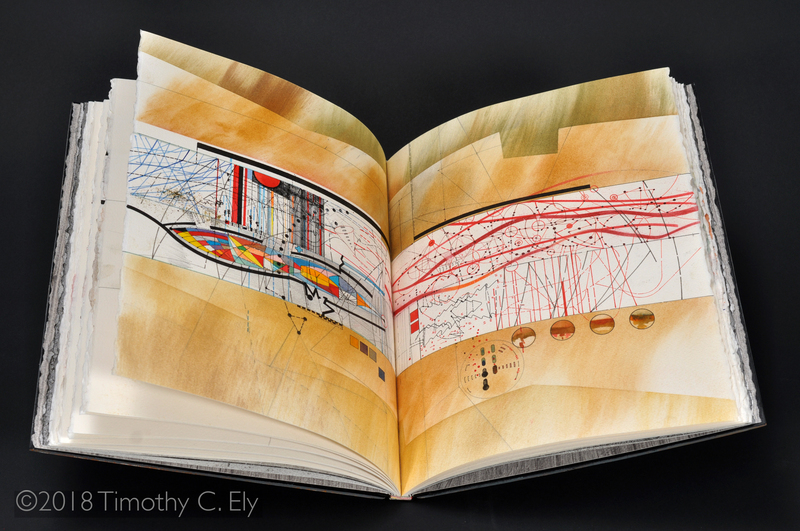 At the page fold, the vertical movement of thick red lines (choral-like synthetic strings) are underpinned by sounds of finer graphic elements. Stair-stepped lines are voiced by Ely’s guitar work, randomly chopped up. Dark polygons (soft washes of chordal tones) give way to a single note piano melody mapped to pitch and rhythm from the grid of small black squares below the piece’s heart. Quartal chording is syncopated around the “written” notes. Radio tuning and granular slicing represent the upper narrow boxes above the heart of the first half. Icy sounds of chilly texture above the heart are joined by thin rising and falling lines. 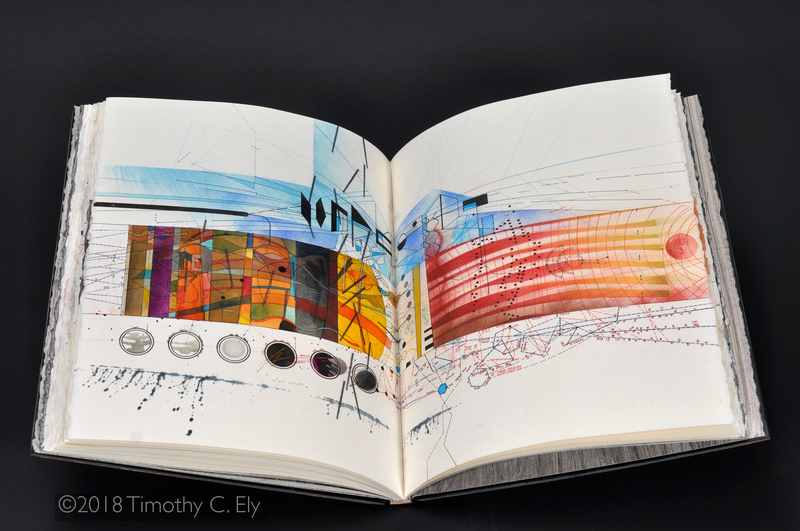 Crisp movement portrays the riot of color in the first section, crashing through the end with tinkling glass. Warm glowing lines (stacked fifths in motion) are overlaid with sine beeps, mimicking the pattern of black squares, all ending in a sub-rattling deep red tone. The background grid (stacked synth tones) forms a bed for the thick black lines (rising and falling brass section) that give way to colorful stacked lines (strings, winds and french horns) ending in harsh black lines (chromatically stacked flutes). The star-specked night sky is surrounded by thunder crashes and granularly sliced radio tuning and generative segments. Beautiful. Will we hear the music?